Apple Pippin, Brambly Hedge and Scrumpy Duck are 3 self catering holiday caravans located in the unspoilt village of Hartland on the stunning North Devon coast. Hartland itself is within an area of outstanding natural beauty meaning that the area boasts stunning scenery with a variety of beaches and an abundance of woodland and coastal walks. Established 3 generations ago our campsite has proved popular with visitors year after year who enjoy what our area has to offer on our doorstep from walking the south west coastal path to surfing at local hot spots, stone skimming and rock pooling. Even on a cold day swap your flip flops for wellies, take a thermos, a picnic and wrap up warm to go stone skimming! Situated on our family owned and run campsite in Hartland each one of our holiday caravans offer guests stylish and well equipped self catering accommodation which is open all year round and where we are happy to accommodate guests for everything from overnight stays, weekends and midweek breaks to full weeks. All of our holiday caravans have been decorated with a coastal theme taking inspiration from the beautiful area in which we live. Apple Pippin, Brambly Hedge and Scrumpy Duck all have well equipped shaker inspired kitchens in either off white or light oak, have generous sunny living and dining areas and have all bed linen, towels, tea towels and many extras provided. Outside each holiday caravan has its own large, private, enclosed lawned garden, with decking and garden furniture as well as ample parking. Our location is undoubtedly what makes staying with us so popular as an easy 3 minute stroll from the campsite will take you down to the hub of the village where you will find everything you need from your daily newspaper and fresh loaf of bread to small general stores selling fresh meat, fruit and vegetables alongside everyday groceries. You will find a couple of great pubs serving food, wine, beer and one which prides itself on its wide array of different branded gins, a great coffee shop ideal for a morning cappuccino and bacon roll not to mention their fabulous cakes, a Post office and general store as well as several art and craft shops offering wonderful gifts to take home. Our holiday homes are located in Hartland village on the spectacular North Devon coast. The village is just 2 miles from the coast with its mixture of pebble beaches, small coves and sandy gullies. Go rock pooling and stone skimming, splashing and paddling, swimming and surfing or just sit and watch the white horses. A day at the beach really is a wonderful way to relax. Alternatively walking the South West Coast Path allows visitors to take in the dramatic coastline with its far reaching views, wonderful wildlife and hidden bays and waterfalls. Hartland has its own Abbey which is open to the public to view the historic house and visit the beautiful landscaped gardens as well as enjoy the fantastic tea rooms. During the season the Abbey also hosts a number of events from outdoor theatre productions to snowdrop Sundays and bluebell weekends. Hartland Quay just 5 minutes away and is where you will find the Wreckers Retreat bar and restaurant with its amazing views along the coast, a local shipwreck museum and beach. Nearby there is Docton Mill and Gardens with tea rooms, Cheristow Lavender Farm with tea rooms and Hartland Point with a great food and drinks cabin. You will not need to go far to find a tea room serving delicious Devon cream teas. We are delighted that in Novemeber last year we saw the much anticipated opening of Pattard Kitchen. Owner and head chef Bjorn Moen delighted guests with his gastronomic dishes when he won best pub food of the year in 2015 whilst he and his family were running The Hart Inn in the village. Returning to Hartland last year he has now opened the restaurant which is just a 2 minute drive (or 10 minute brisk walk!). An absolute must for a special occasion or just a treat whilst on holiday. Alternative favourite eateries of regular guests include The Old Smithy in Welcombe, The Bush Inn in Morwenstow & The Hoops Inn at Horns Cross. Just outside of the village you will find the world famous Clovelly village is just 5 minutes away and offers visitors a unique opportunity to walk down a cobbled street and experience the beauty of the privately owned fishing village. With events throughout the year from the lobster fest to the wonderful Christmas light switch on, Clovelly offers something for everyone. The Milky Way is just 10 minutes away and The Big Sheep just 20 minutes away and both offer wonderful days out for our little guests (and most of our adults too!). Visit their websites for detailed information. Take a day trip to Lundy Island by boat on the Oldenburg from Bideford or Ilfracombe. This pretty island is full of charm and delights visitors year after year. Just 20 minutes to the East is the Little White Town known as Bideford where you will be able to find a Morrisons and an Asda, banks and fuel stations as well as several small independent shops and cafes. Drive 20 minutes in the opposite direction and you will arrive in the beautiful Cornish town of Bude. Bude has a Sainsburys, a Morrisons and a Lidl as well as banks, fuel stations and several small independent shops. Bude also has a beautiful sandy beach and a great swimming pool. Trains come into Barnstaple station which is 40 minutes away and national buses run to Bideford from where you can catch local buses to the village. The bathroom has a shower, WC and basin. All bed linen, including additional throws and blankets are included at no extra cost. There is a laundry room on site. There is parking for up to two vehicles directly outside of your accommodation and plenty of additional parking onsite. Two towels per person are included at no extra cost. The living room has a clever arrangement of two corner sofas allowing you a very sociable area complete with TV/DVD player, a small DVD and book library and plenty of board games. There is an electric filter coffee machine ensuring warm coffee on the go as well as a cafetière. There is a well stocked kitchen with pots, pans, cutlery, crockery and utensils. In the well equipped kitchen you will find a gas oven, hob and grill, a microwave, a toaster and fridge/freezer. There is a VQ radio which features DAB, DAB+, and FM radio reception. It has Bluetooth and an aux connection as well as built in alarm clock. Golf can be played in Bude at The Bude and North Cornwall Golf Club, or in Westward Ho! at The Royal North Devon Golf Club, which is England's oldest course and is 25 minutes away. Alternatively, on the outskirts of Barnstaple you will find The Portmore Golf Club which is 35 minutes away. Outside: Directly outside of your caravan is a large decked area complete with built in seating. This leads into your enclosed garden whee you will find a picnic table and benches. Your garden is completely enclosed and private and is therefore perfect for those of you travelling with a dog. Outside of your garden is your private parking for two vehicles. Ample other parking is available should you need it. Utility Room: The caravan does not have a utility but a fully equipped laundry with washing machine and tumble dryer is conveniently located to you. Cleaning / Towels / Linen / Maid service: All bed linen is provided and beds are made ready for your arrival. Two towels per person are provided at no extra charge as well as tea towels and cleaning products. If your stay is for more than a week all linen, towels etc are changed. All the little touches that made this place feel like home were really welcomed. We were very comfortable. Zoe was very helpful and welcoming. Only slight issue was the noisy traffic early in the morning/late at night that woke us up. Other than that, a fabulous place. The caravan had great facilities and very impressed with how clean and cosy it was. Had a lovely two night stay in the Scrumpy Duck. Spotless, bright and very nicely furnished with everything we needed. We arrived quite late and thinking we would walk into a cold caravan but heating was on and it was lovely and cosy. Would return and recommend to family and friends. Location was great and just love visiting the Quay. 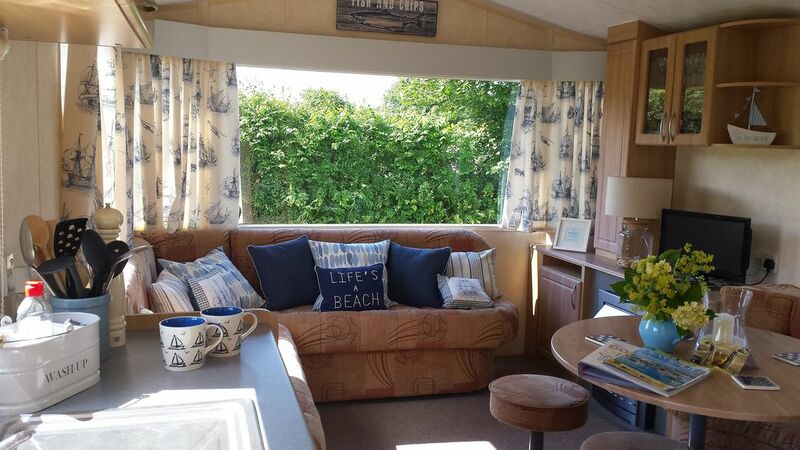 A really lovely caravan packed with loads of extras. Zoe was a perfect host, nothing was too much trouble! Hartland is such a lovely village, locals are really friendly. We ate out at the Hart and Kings Arms, couldn’t fault either of them, both dog friendly. I can also recommend the burgers from the local shop (pop in) great on the bbq!! Thank you for your review. I am delighted to hear that you thought the caravan was beautifully decorated and had everything you needed as well as being in a lovely location. I am sorry that the alarm went off during your stay but equally pleased as they are an essential part of your safety. Each caravan has two smoke alarms and two carbon monoxide alarms and are checked at each change over. I understand that if the batteries do go when you are there it can be very annoying but this can happen and I am sorry you missed us in the office and very grateful that you replaced them. There is a very comprehensive information file in each caravan which is updated every year and details everything about Hartland as well as all of the local information leaflets and a visitor book which is completed by guests specifically offering future guests their recommendations in particular where to eat but you are absolutely right we are lucky to live in a village where the locals love passing on information about the area and often this can be even more useful. Your caravan was accidentally locked and the caravan next door unlocked hence the cleaning basket had not been left in the correct caravan, again I am sorry that this happened but it was an innocent mistake which has never happened before and I can’t imagine happening again. Again, I think you are right to suggest a fan and had we realised such a heatwave was about to take place we would have acted sooner. We now offer a fan to guests should they require one. Every bedroom has a heater and there are additional blankets in the cupboards should they be required. Again, thank you for your review. Everything you could want. Very clean and well kept. The Rowan Tree in Clovelly offers a number of craft courses. The Plough Arts Centre in Torrington runs frequent art and craft workshops for adults and children and due to our rural location we have an abundance of talented craftsmen and women who encourage a "have a go" mentality, so courses and opportunities can arise anywhere! Hartland is surrounded by beaches due to our proximity to the coast. We have a mixture of pebble and sandy beaches on our doorstep. Popular beaches are The Hartland Quay, Berry, Spekes and Blackpool all of which are only 5 minutes away. The photograph you see here on my page shows our dog Herbie enjoying Blackpool beach. A pebble beach but with a fresh water pool it's a dogs must! Drive for 25 minutes to Westward Ho! for long stretches of sand or travel for 15 minutes to Sandymouth. Hartland is 40 minutes from Barnstaple which provides our nearest train station. National buses come into Barnstaple and Bideford and link with local buses which come to Hartland village and stop right outside our entrance. Newquay and Exeter are our nearest airports. Our caravan site is in the village so a 3 minute stroll will take you down to the "hub" of the village. On our doorstep is Hartland Abbey, Hartland Point and Docton Mill. The Milky Way Fun Park with new wake boarding facility is just 10 minutes away and The Big Sheep 20 minutes away. The world renowned Clovelly is just 10 minutes away. Torrington is 40 minutes away and has RHS Garden Rosemoor and Dartington Crystal. In the village we have a Post Office, which has a wide selection of groceries, wines, beers, spirits, as well as a cash machine and usual newspapers and magazines. The Pop In store which sells fresh bakery items, fruit, vegetables, a wide selection of groceries and has a lottery outlet. The Shamrock selling fruit and vegetables. Giffords DIY offering everything DIY and a lot more. Milthorne Chairs where Bob hand crafts the most amazing chairs and stools and has also become an accomplished photographer and now sells beautiful coastal themed framed photographs. James Morely Furniture where another local craftsman produces lovely bespoke pieces. Springfield Pottery selling beautiful pottery made by the famous Leach family. Sarah a local potter who sells her wares from her home and who also offers you the opportunity to have a lesson with her. The White Hare Gallery which sells a beautiful selection of originals, prints, cards and much more as well as offering art classes and hosting our newly appointed tourism hub for the village. There are always lots of village events from Fetes, Craft Fayres and coffee mornings to Garden Shows and an annual Carnival where the streets of Hartland come alive. The nearest attraction to the village is Hartland Abbey set in beautiful grounds and hosting events throughout the year. On the outskirts of the village is where you will find Cheristow Lavender Farm, Docton Mill and Gardens and the ever popular Hartland Point with cafe. Eat in the village at the Hart Inn, The Anchor or The Kings Arms and walk home. For a night in pick up some fish and chips from The Square of have a local lady make and deliver authentic Thai to your caravan. Jump in your car for 5 minutes and have a meal with a view at The Hartland Quay. Clovelly, Morwenstow and Welcombe, all provide restaurants or pubs. Bideford has a Tescos, Morrisons and Asda. Bude has a Sainsburys and Morrisons. Banks, cash points and garages are in Bude and Bideford. Booking Notes: On booking you will be sent a confirmation of booking and you will need to pay a £50 non refundable deposit. The outstanding balance can then be paid 4 weeks before your arrival, if time allows or if not as soon as possible. There is no additional charge for a dog. Changeover Day: Changeovers can be made on any day which works with existing bookings. Arrivals are welcome from 3pm and departures are requested by 10am. Notes on prices: Please note the price of £65 per night is based on 2 people sharing.